I remember many years ago when I first moved to London, my family went about systematically adopting Chinese restaurants. La Orient and China Chef for our local Chinese fix, Mandarin Kitchen in Bayswater for noodles and aromatic duck and New World in Chinatown. New World in particular would be visited once a fortnight so my family could satisfy their burgeoning dumplings fix, with their wares being brought round on trolleys. Being a fussy eater as a child, this was ideal. I could peruse each trolleys contents with my dad and "help" to order. I felt important, and we got our food almost as soon as we sat down at our table. I would be able to see all the different types of food pass by, and not miss anything. I used to pay close attention to the refuelling hatch, and give my dad a nudge when they started to refill the trolleys with fresh dumplings. I loved Dim Sum Sundays. Cue 20 years later and the trolleys still roll at New World, but gone are the tasty and fresh dumplings, only to be replaced by claggy tourist fodder, with trolleys merely used for show. I haven't been back for over 5 years, but just like the restaurant collectors my parents once used to be, I have been seeking out the perfect dim sum location in London. At the moment, I favour Dragon Castle as my Dim Sum location of choice. It's near my home, the noodles are excellent, good value and the dim sum are fresh (as long as you get there by 1pm). But that hasn't stopped me from looking for new dim sum locations. Two new places I have visited lately, worthy of a mention, are Dragon Palace and Golden Pagoda. 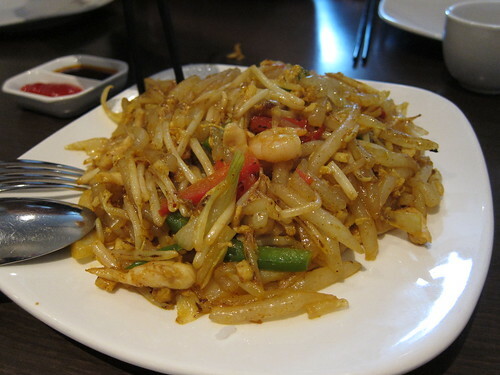 Located in Earls Court, Dragon Palace has been visited by a number of bloggers recently, although it was Su Lins post which tipped me off first. After a couple of aborted attempts, I eventually made it there one Sunday. Ordering some firm dim sum staples, as well as a few items I don't see on a dim sum menu every day, most of what we got was good. The steamed dumplings in particular were very good, packed full of flavour, and the translucent skins withstanding some clumsy chopsticking. 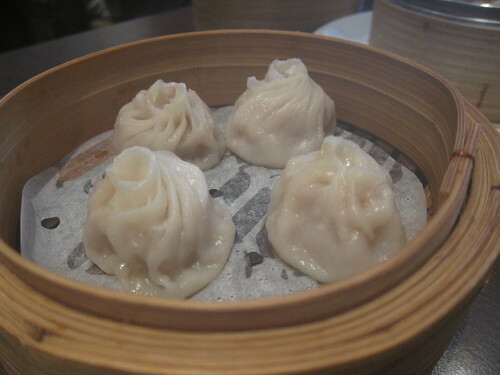 The xiao long bau (or "soup" dumplings) were amongst the best I have tasted in London, and worthy of their own sentence. 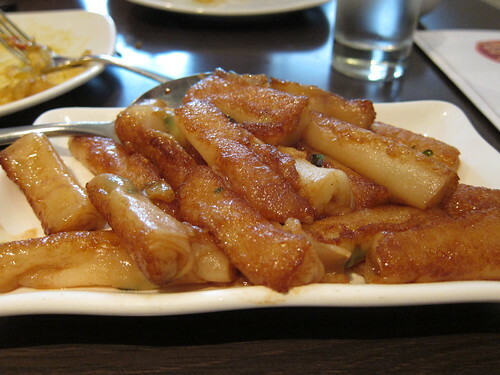 New things to me included wobbly grilled sticks of cheung fun, moreish and smoky, and silver tip or "rat tail" noodles, which were slightly unconventional in their texture, but nothing that outstanding in flavour. There were a few duds in the meal, with the wu kok (yam croquettes) overcooked, dry and mostly flavourless, and the service being pretty consistently terrible. Picture asking whether you have finished by 5 different people, and telling them one by one that you were still waiting for two dishes. After the 5th person asked us, we got the idea and got the bill instead. A sad way to end an otherwise enjoyable meal. 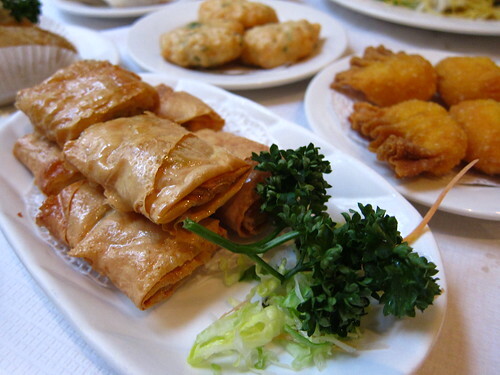 Which brings me to another new dim sum destination I visited recently, Golden Pagoda in Chinatown. It's not often I take tips from my mum, but after her colleague had suggested it, I agreed to meet my parents at Golden "Buddha". After 10 minutes of walking around, and checking out numerous restaurants called golden something, I met my parents outside of Golden Pagoda. No trolleys in here either, and I really wasn't expecting much owing to it's rather central Chinatown location. I am glad to say I was pleasantly surprised. I have grown to expect the worst of Chinatown. After all, every week, the restaurants change names, change façades, nothing rarely stays constant in Chinatown, it draws in tourists, feeds them, and spits them out from whence they came. 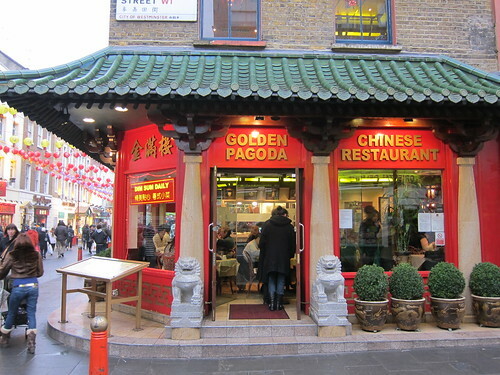 I could bore you to death about the history of Chinatown (I wrote my dissertation on it), but I won't, I will just leave you with the fact that Golden Pagoda is very good. The fried goods were relatively greaseless, the dumplings were steaming hot and packed full of pork, prawn and scallops, and noodles crisp and moreish. Even the service was attentive and efficient, unheard of in most Chinatown restaurants. So there you go, after years of trying to find good and affordable dim sum in London, I stumble across two places I would happily visit again within two weeks of each other. You would struggle to spend more than £15 a head in either, and obviously, the more people you go with, the more stuff you can eat and the cheaper it will inevitably turn out. Having said all this, I am not sure if I will make the pilgrimage to Earls Court or head up to Chinatown for my regular Dim Sum fix. Dragon Castle is close, and if you head there before 1pm when the crowds really start to pick up, the food is fresh(er) and tastes great. The only thing that would make it better, trolleys I tell you. Trolleys. Should mention that it didn't put them off though...they returned last weekend too! Good tip on Golden Pagoda. I know C-town is not ideal for finding good Chinese food, but it's just *so* conveniently located! 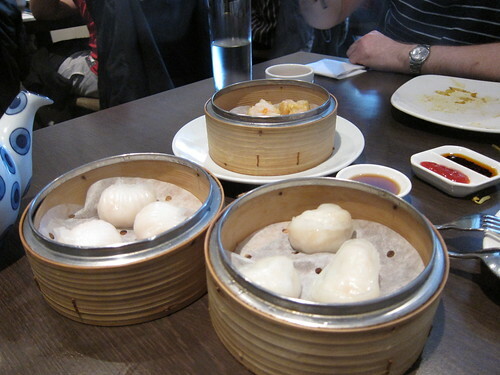 Mmm i love dim sum. Dragon Palace looks lovely, and the reviews on other sites are great. Will certainly check that one out. As for Chinatown - no thanks! Ah... I miss the trolleys too. The rowdy, buzzy atmosphere complimented by the rattling of the trolleys - it used to be the definitive yum cha experience! Someone told me that even in Hong Kong they have started to cease using trolleys... the end of an era! So strange, I encountered none of that business with Dragon Palace when I went, and there were people waiting for tables. I'd have lost my temper with that if I were you. But their steamed stuff is so delicious! lovely blog - I'm following! 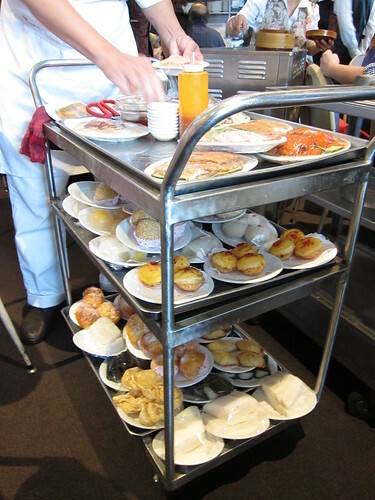 I used to think ALL dim sum restos had trolleys until I was disabused of the notion in London. Boo to the no trolley. I miss the trolleys too! Such a great way to try new things. Anyway good discovery of decent dim sum actually in Chinatown - who would have thought?! had anyone been recently and for dinner? is it still good? 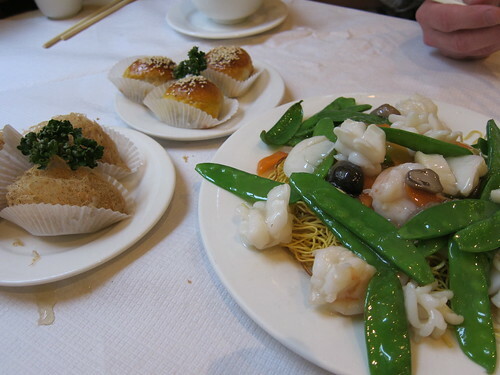 I have only been staying London for a week and I'm already missing dim sum and dumplings. I enjoyed English foods but no offense, they're not really my thing plus add the fact they are quite expensive. It's a good thing I'm staying at one of those budget london hotels or else I will go home penniless. It's one of the things I enjoyed too during my Asian trips. Nothing beats authentic Asian foods, it's far from those Chinese takeouts that I usually order. Two True Shokutsu - Cooking and eating the world.